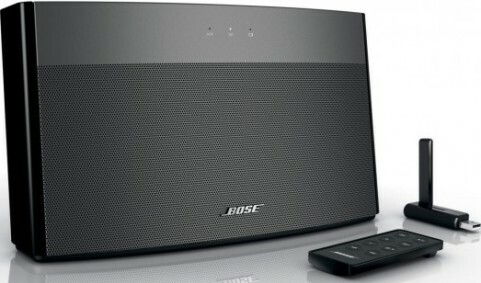 The leading maker of audio equipment, Bose Corporation has introduced its new 1-piece portable speaker system, dubbed as SoundLink wireless music system, which allows users to enjoy music stored on their computer around the home, featuring an exclusive Bose waveguide speaker technology and neodymium transducers to ensure room-filling, superior audio quality. The SoundLink is easy to setup without the need of a software or Wi-Fi connection, just plug in the included SoundLink USB key into a computer and your selected favorite music will stream to the speaker system via a long-range wireless link that able to work through most walls and floors. In addition to computer, Bose SoundLink wireless music system also can connect to more audio sources including iPod, iPhone, MP3 player and CD player, thanks to its auxiliary input. The new Bose SoundLink that includes an infrared remote control and rechargeable lithium-ion battery (supports up to 3 hours of full-volume playback) for truly portable experience is scheduled to be available starting August 27 for around $550.